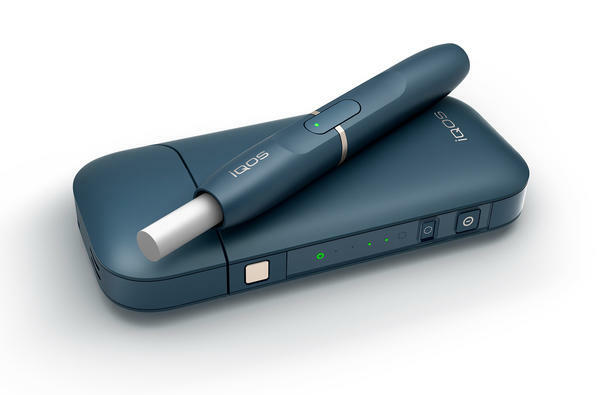 Philip Morris' iQOS device heats tobacco but stops short of burning it, an approach the company says reduces exposure to tar and other toxic byproducts of burning cigarettes. The advisers voted 8-1 to support cigarette giant Philip Morris' claim that its "iQOS" system "significantly reduces your body's exposure to harmful or potentially harmful chemicals." The device heats tobacco but doesn't ignite it. Philip Morris wants to put the first tobacco product on the U.S. market that it claims is safer than cigarettes. The tobacco giant took a step towards that goal today thanks to the Food and Drug Administration. NPR health correspondent Rob Stein is here in the studio with details now. Hey there, Rob. ROB STEIN, BYLINE: Hey. How you doing? KELLY: First, what exactly is this product that Philip Morris wants to sell us? STEIN: Right. And it's actually a pretty complicated electronic device. It sort of looks like a fat pen. But inside, there's a battery that's used to heat up a very tiny blade. And that blade kind of stabs a wad of tobacco inside it, inside something called a heat stick. And that hot blade heats up the tobacco, and that produces an aerosol that has nicotine in it that users inhale to get their nicotine fix. KELLY: All right, so walk me through this. We're talking tobacco. We're talking heating up that tobacco. We're talking nicotine. Why is this safer than a cigarette? STEIN: ...Like a regular cigarette does. And so that produces this aerosol I mentioned, not smoke. And the company claims that that aerosol has about 90 percent less of that really nasty stuff in tobacco smoke that causes cancer, heart disease, all kinds of diseases. Now, the company says, look; these things aren't totally safe, but they estimate it could - they could save 90,000 lives over 20 years in the United States if enough smokers are using these devices instead. KELLY: So one argument in their favor is they're safer, Philip Morris says. But why would smokers go for this when they have other options? I mean, there's e-cigarettes that seem to be everywhere now. I see people with nicotine patches and chewing nicotine gum. Why do we need another product? STEIN: Yeah, so the key here, again, is that these things actually contain tobacco. STEIN: You know, e-cigarettes - they have a liquid inside that's heated up that has nicotine. Nicotine patches and gum - that just delivers nicotine through the skin or through your gums. And the company says, look; this has tobacco - could give smokers that sort of taste and experience of smoking a regular cigarette that might be more appealing. KELLY: Is the goal here - like patches, like gum - to eventually wean a smoker off of smoking? STEIN: Yeah, that's the idea here. But you know, everybody agrees the best thing smokers could do would be to just quit. And I got - I have to say that, you know, there's a lot of skepticism about these devices, especially among some of the anti-smoking advocates. They say, look; you know, we've been here before with big tobacco. We remember light cigarettes and mild cigarettes and low-tar cigarettes. They're all supposed to be safer - turned out not so much in the end. STEIN: ...Because they look cool. And they might try them and end up having a new generation of nicotine fiends out there. KELLY: Now, all those concerns notwithstanding, we mentioned the FDA just gave Philip Morris a leg up. What did they do? STEIN: Yeah, so there was an advisory committee that concluded a two-day hearing today where they sifted through all the scientific evidence. And the committee basically gave the company kind of half a loaf. It said, yeah, it looks like you're right that there probably is less nasty chemicals in this aerosol than in tobacco smoke, but we're not convinced that necessarily translates into fewer cases of illness and fewer deaths. There just isn't enough evidence yet to know that for sure. So you know, we can't go that far at this point anyway. KELLY: All right, that is NPR health correspondent Rob Stein. Thanks so much. STEIN: Oh, sure - nice to be here. Transcript provided by NPR, Copyright NPR.